It was fun to see that on this week’s Tabletop show, they are playingone of our house favourites, Castle Panic. The show gets a bit more loud and manic on this game than on previous episodes, but that’s down to the chemistry between Wil and whatever guests he has. This is definitely one of the great, fun social games for folks who like beating up on monsters. 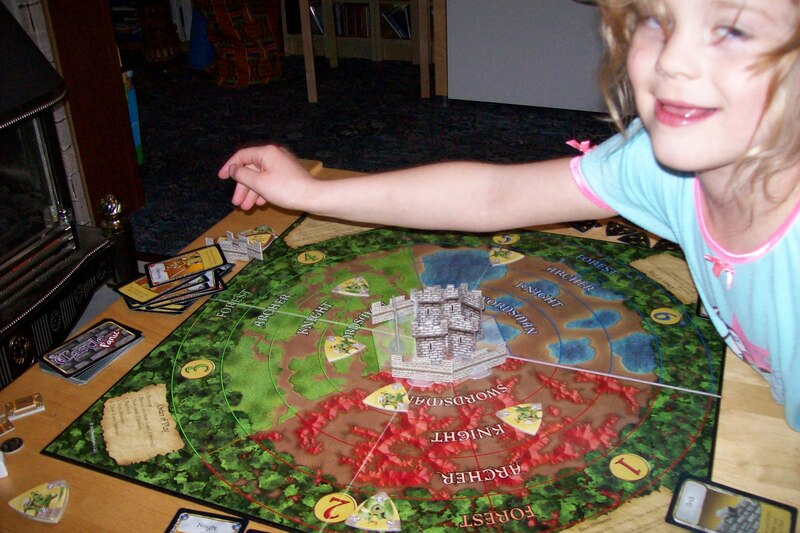 As it turns out, Miss B and I had a good game of Castle Panic at the weekend. We lost most of our walls and had a dodgy spell towards the end where the board was full of trolls and we had cards that were all the wrong colour, but eventually managed to chalk up another mighty victory for the valiant defenders. Well, in a nutshell we had a load of fun. We have played a couple of times so far. First we had a cut back game with the boss monsters and some other monster effects removed, but couldn’t finish before bedtime. Our next attempt had only the boss monsters removed and we successfully defended the castle to the end, though at the loss of half our towers. Miss B was thoroughly enjoying slaying monsters and by the end of the game was starting to get the hang of working out which attack cards each of us would need on the next turn. We kept track of who slew which monster, and Miss B was pleased that she slew the most, but overall she was far more interested in our team effort. Of course, a potential problem with this game is that a dominant player may end up calling plays for everyone, so we’re going to keep an eye on that. So far, after the first few turns of hand-holding, I’ve just tried to ask Miss B what she wants to do in each phase of her turn and if she didn’t know, I’d suggest a couple of options. Hopefully that’s working for everyone. The game: Castle Panic (Fireside Games), 1 to 6 players aged 10+. Do you have a prince for my frog spell?